Begin by downloading the zipped font. Left-click on the font of your choice and a "save file" screen will pop up. Select the folder into which you want to save the zipped file. The "My Computer" window will open. The "Control Panel" window will open. The "Fonts" window will open showing you the installed fonts. Click on "File" and when the pop-down window appears select "Install New Fonts". The "Add Fonts" window will appear. There will be a white text box labeled "Folders". Navigate inside the Folders List box (by double-clicking on the c:\) until you find the folder into which you unzipped the font(s). After the fonts are loaded, they will be shown in the white text box labeled "List of Fonts". You can scroll through the "List of Fonts" list box and select the font you want to install. 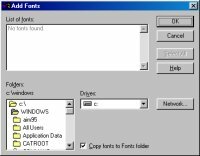 You can click on one font, or select more then one by holding down the control key as you are clicking on each font, or by clicking on the first font, holding down the shift key and clicking on the last font you want installed. You can also click on the "Select All" button. 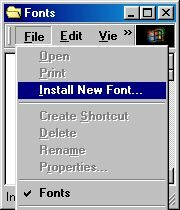 NOTE: If you try to install fonts which are already installed, you will be presented with a warning window telling you that you cannot install the font unless you first un-install it. This is a harmless warning which allows you to continue with the other fonts by simply pressing the <OK> button. After the font is selected (it will be highlighted), press the OK button. The font(s) will then be installed. When you are done, press the close <x> button on the top right corner of the window. 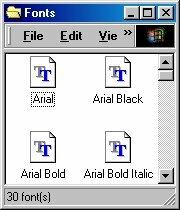 You will be returned to the Fonts window, and the font you've just installed will be included there. You can now close the Fonts window, close the Control Panel, and close the "My Computer".